Helgoland is a small rock island in the Atlantic Ocean. It is located approximately fifty kilometers north of the mainland of Germany. After the last Ice Age, around 4000 BC., the sea level rose and Helgoland was formed. It was already inhabited in the Neolithic era and the island was later incorporated into the Viking kingdom. In the days of the Hanseatic League and the sea trade Helgoland was a notorious pirate nest. The name Helgoland probably comes from ‘Holy Land’. In the Middle Ages it was an important place for the worship of the Frisian God Fosite. There is a saga in which Fosite saved the Frisian freedom on Helgoland. In their own language the island was called ‘Lunn’, which means simply ‘land’. Initially the island belonged to Denmark and later to Great Britain. England and Germany exchanged Helgoland and Zanzibar and since then the island is German. After a violent storm in the winter of 1720 and 1721 Helgoland consists of two islands, Helgoland, also called the ‘Hauptinsel’, and Düne, a sand island. Originally, this dune was connected to the main island by a natural barrier of sand and boulders, but the storm surge on New Year’s Eve from 1721 torn island and dune apart. Helgoland is only 1,7 square kilometers and the most important feature is the rock-edge Lange Anna. The steep, red rock walls of the island attract thousands of birds. Especially during the bird migration, in the months of april and may and september and october many birdwatchers visit Helgoland. 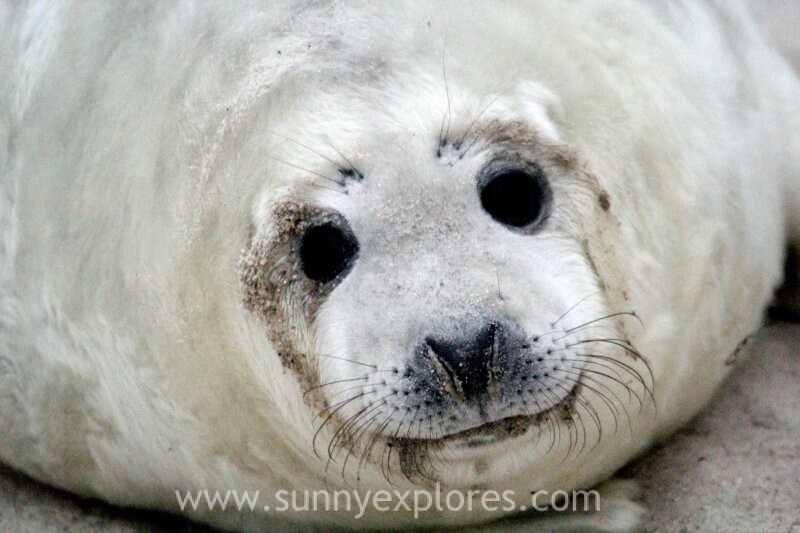 Düne is best known for its seal population. And for these seals I visited the island. Düne has a length of about 1000 meters and a width of 700 meters and has several beaches, where you can see seals, but also can find fossil and red flint. 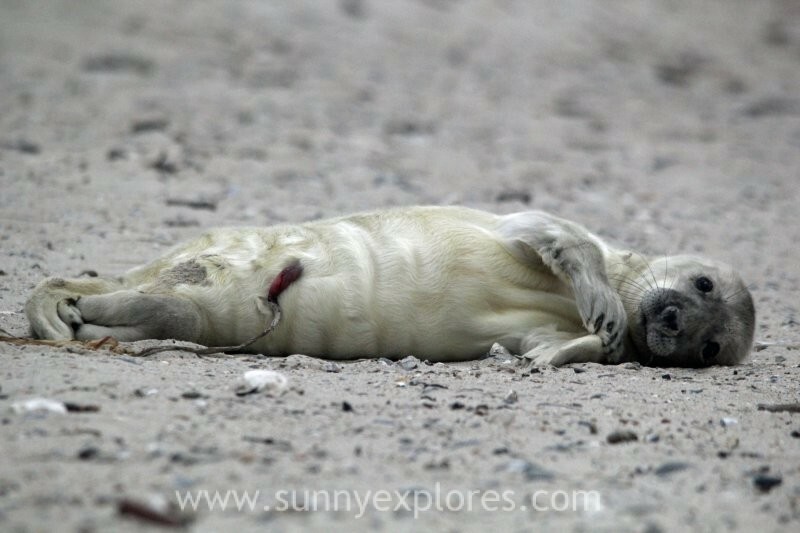 Düne has a vast colony of grey seals and from mid-November to mid-December the female seals throw their young on the beach of this sand island. 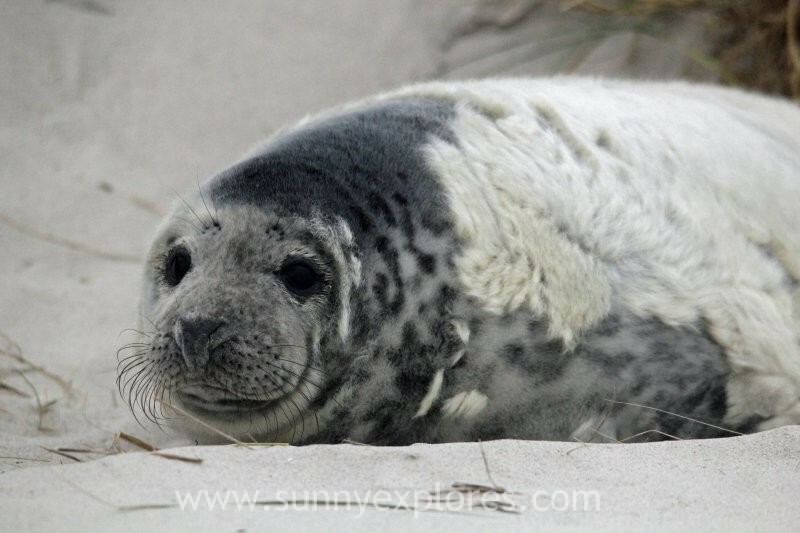 Grey seals are impressive animals: a male can grow up to 3 meters long. 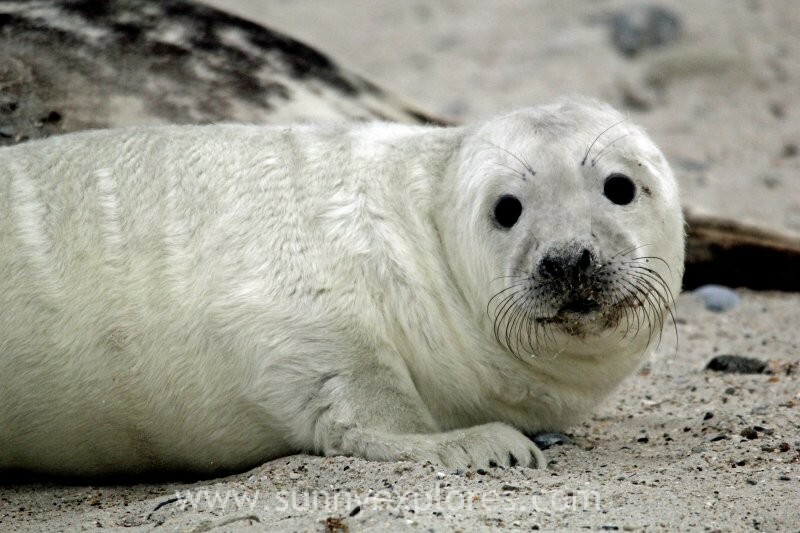 The seals on Helgoland are wild but used to people. You can approach them rather close. 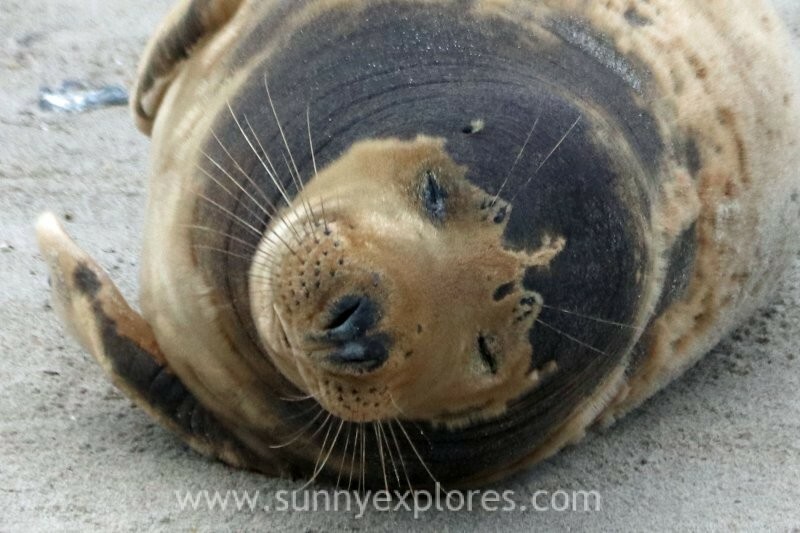 But be aware that they are and remain wild animals, so it is important to keep to a number of rules: keep 30 meters distance to the seals, do not make noise, don’t feed and take caution, seals are after all predators. 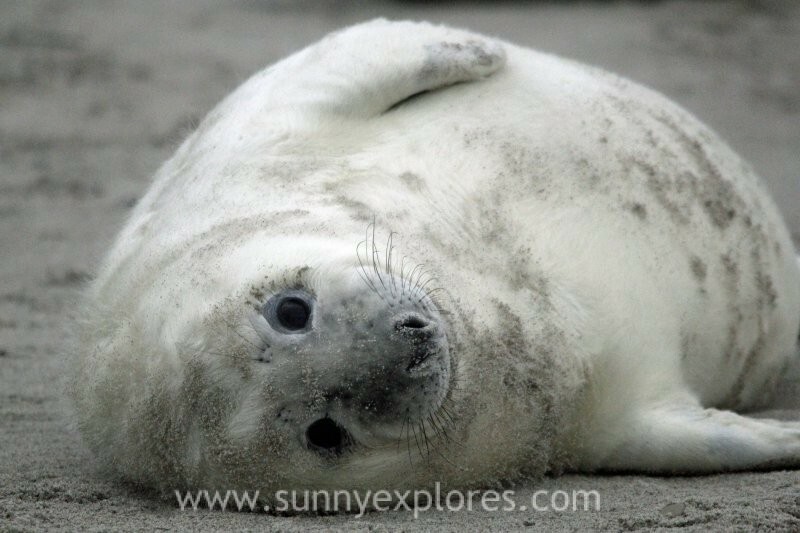 The baby seals look cute and cuddly with their thick white fur. This coat protects them from the cold winter temperatures and North Sea storms. At birth a pup weighs about 15 kilos. 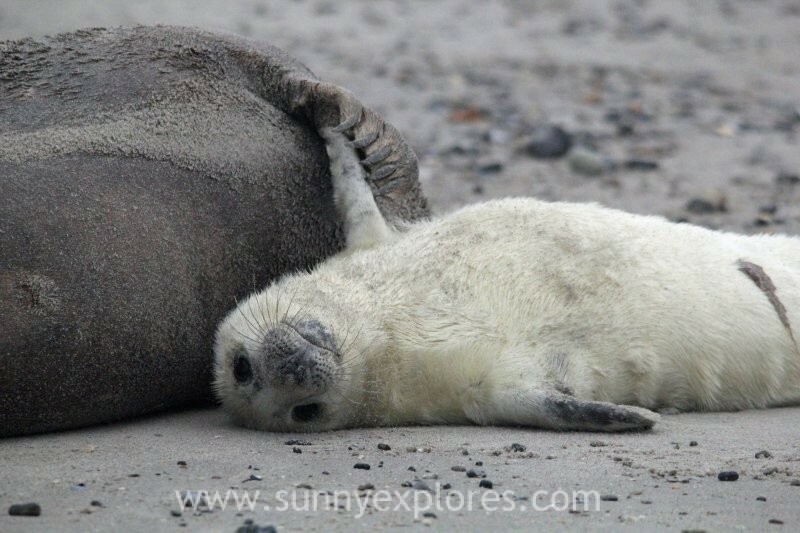 The babies come in weight about 1 to 2 kilos per day and weigh more than 50 kilos after a month. The extremely fat mother’s milk ensures a rapid growth and a firm layer of bacon. After a few weeks, after the fur coat has disappeared, the youngsters follow their parents into the sea. 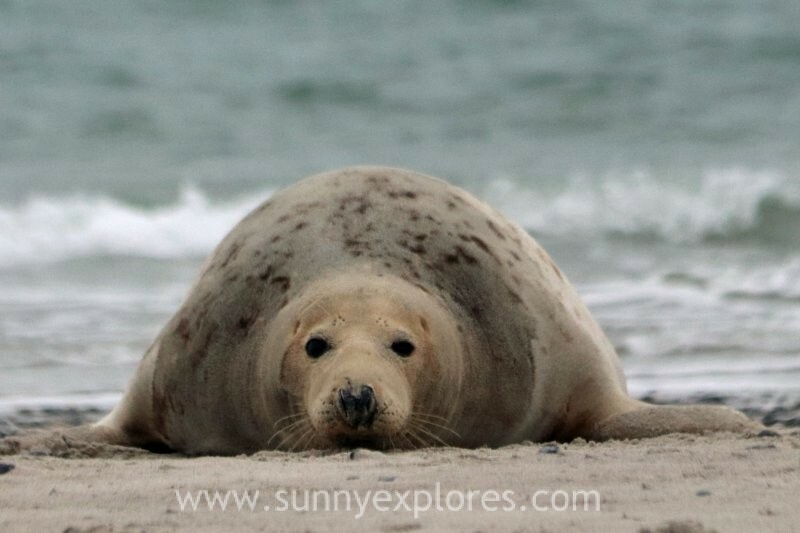 Visiting Helgoland in the time of seal birth is a great experience. Realize that it will be cold. It is of course winter, but the wind chill will be low on an island that is sensitive to wind and fog. 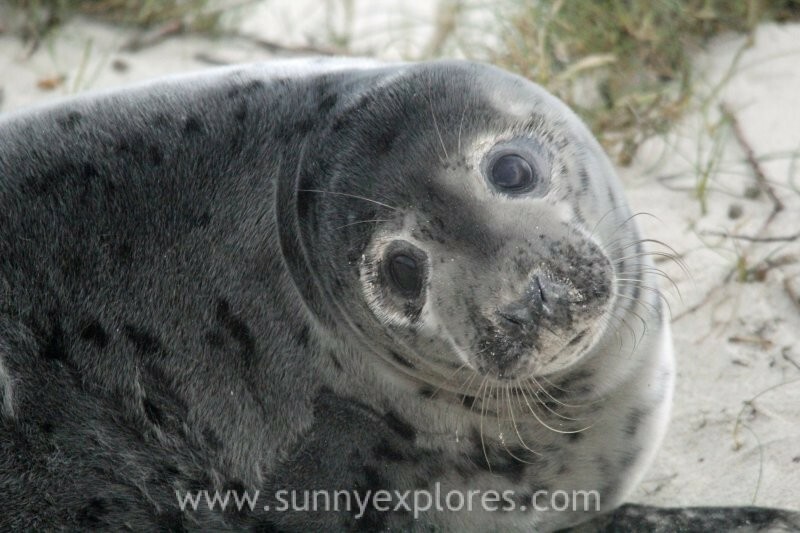 Dress warm when you are outside for a long time to photograph the seals. But it is worth it to brave the cold: it is unforgettable to see the curious pups discovering their surroundings. And the adult animals are beautiful with the protective colors of their fur. It’s a stay you will cherish forever! If you want to photograph the animals, here are some photography tips. It is advisable to use higher ISO values and slower shutter speeds. 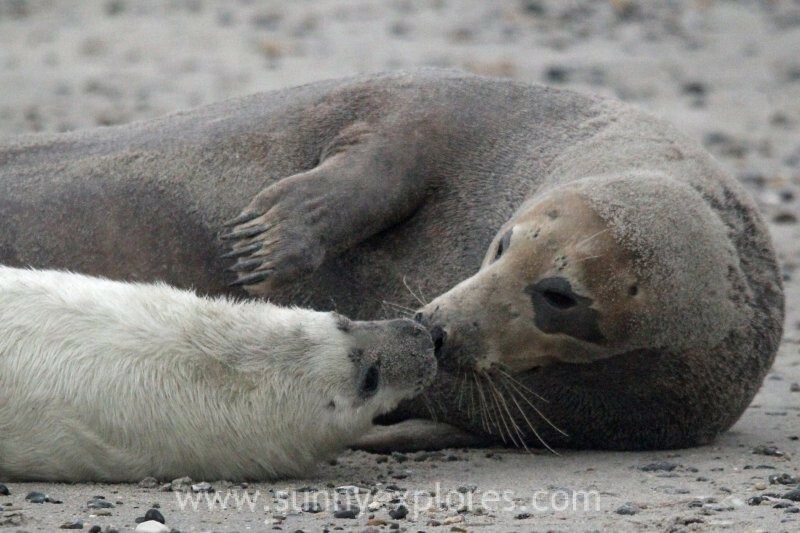 I prefer to be at the beach early in the morning: there are less people then and the seals are more active. But ofcourse the light comes late in december. The seals do not lie still and that makes it difficult to take good pictures in the morning light. Although a lower ISO value causes less noise, it produces hazy photos. A telephoto lens in combination with low light means slow shutter speeds. A higher ISO value, for example 1600, limits that time, but if you go higher, the noise will soon become a problem. Even with that high ISO value, exposure times of 1/15 seconds are very common at certain times. A tripod is therefore useful. 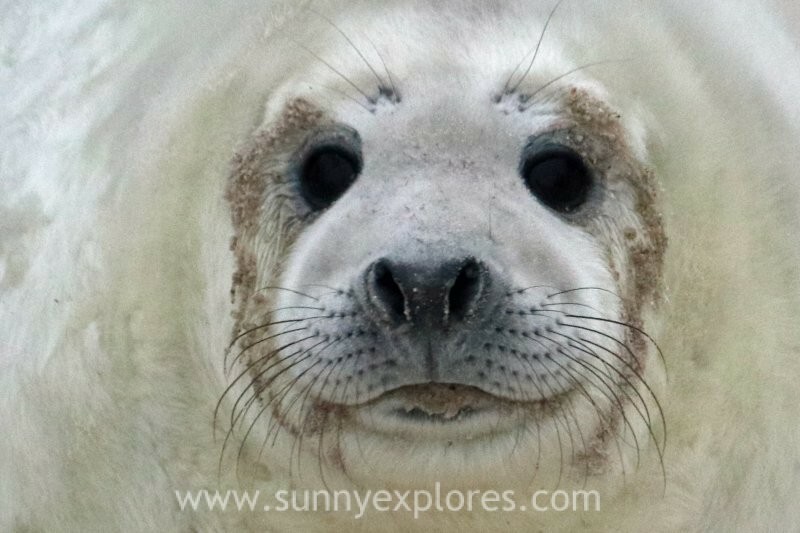 With some preparations and efforts it is possible to take good pictures, but don’t forget to enjoy the spectacle of seeing the seals so close. It’s about the experience of being close to nature, not about taking good photos.